Lab 1: Are Fingerprints Inherited? Lab 2: Are You Left or Right Sided Brain? Lab 3: The Nose Knows Smell but How about Taste? Lab 4: Which M&M do you like more? Lab 5: How Sensitive is Your Hearing? Lab 7: Are Your Eyes Playing Tricks on You? Lab 10: Can Peppermint Improve Reaction Times? 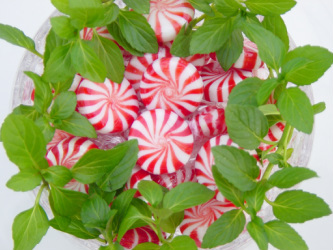 Does peppermint actually affect performance? Can you actually do better if you're given food before an exam? In this lab, you'll investigate the properties of peppermint candies, a common exam candy that is given to students to help them focus more on tests. 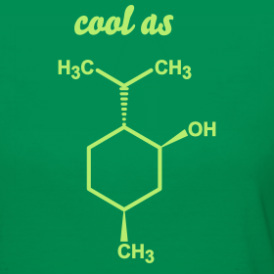 What gives peppermint that cool taste? The structure to the right! What will you do in this experiment? You will test if peppermint will help improve reaction times of a set of tests you will give to test subjects. This experiment requires you to provide calculations and math to prove if your results are because of error or random chance. You will need to be familiar with the CHI-SQUARE TEST. Use the following tutorial to help you calculate the chi-square test.